In a bold bid to establish itself as the de facto online storage centre for music, Amazon has taken the covers off its new Amazon Cloud Drive and Player offering, which offers to securely store your music on its servers and stream it to your browser or Android device . The first 5GB of cloud storage space is served up for free, with anyone purchasing an MP3 album from the company having the allocation boosted to a generous 20GB. The idea is simple enough, with consumers able to upload their tunes (or any other files, for that matter) to the cloud storage space which is hosted on the Amazon Simple Storage Service. Once uploaded, the music can be streamed over the web to any computer or to an Android mobile device using Amazon’s new app (or via the browser). “The launch of Cloud Drive, Cloud Player for Web and Cloud Player for Android eliminates the need for constant software updates as well as the use of thumb drives and cables to move and manage music,” said Bill Carr, Amazon’s vice president of movies and music. Note that it’s Android only – there’s no Apple app and it won’t work with iOS browsers, so Phones, iPads and iPod touches are out of luck short of employing a botch. We’re guessing that this could be down to Apple blocking the app as it would rival their own forthcoming alternative or because Amazon don’t fancy forking out for Apple’s subscription fees. There was no announcement about what happens when customers reach the 20GB threshold – we’re assuming a extension fee would be charged – and, frustratingly, there’s no information about whether the service will be made available in the UK. What is the cloud?The cloud is a term used to describe the Internet. 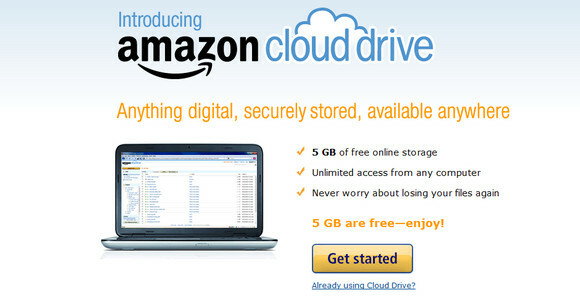 Amazon Cloud Drive is your hard drive in the cloud. Securely store your music, videos, photos, and documents online and access them from anywhere. All you need is a web browser to upload, download, and access your files from any computer. Back up your files to ensure that your music, photos, and personal documents are available to you wherever you go. Learn more about Cloud Drive. Will all of my previous Amazon MP3 purchases already be in Cloud Drive?No, but you can save all new Amazon MP3 purchases directly to Cloud Drive for free. Start with 5 GB of free Cloud Drive storage which can be used to upload your existing music library, as well as videos, documents, and other digital files. Read about how to upload music. 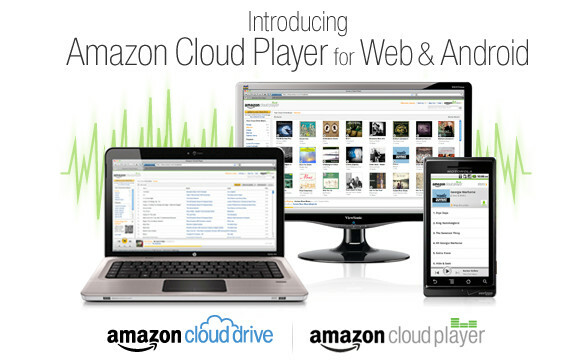 Will I be charged for using Cloud Player or Cloud Drive?Cloud Player is a free web and Android application. All customers start with 5 GB of free Cloud Drive storage and you can upgrade to 20 GB of Cloud Drive storage with an MP3 album purchase (learn more about this offer). All new Amazon MP3 purchases saved to Cloud Drive do not count against your storage quota. Amazon also offers a variety of Cloud Drive storage plans to meet all of your data storage needs. Find out about Cloud Drive storage plans. Can I upload music from my phone?Uploading music from your mobile device is not possible at this time, but you can upload music from your PC or Mac. See how to upload music. How do I know how much Cloud Drive storage I’ve used?When you are in Cloud Player, you can see how much storage you’ve used by looking at the top left corner of the player screen under the Upload to your Cloud Drive button. View your storage usage and manage your files. Just another cool thing from over the pond that we in the UK are unable to use….it makes me so sick! Very good move, needs wifi to work properly as I can’t see mobile networks being able to cope with the surge in data demands this will produce.